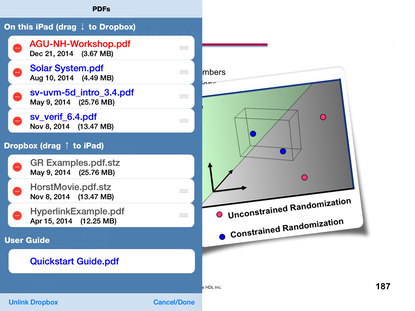 The most amazing way to present PDF slides wirelessly to an audience from your iPad. I developed Screen Talk to meet my personal needs as a professional instructor and in true, eat-your-own-dogfood fashion I use this App every day in front of customers. I spent months giving Screen Talk an intuitive, "low-chrome" feel. Entirely touch-driven, Screen Talk lets you move freely and confidently within your materials and thanks to AirPlay, EVEN among your audience. In my opinion, Keynote and Powerpoint are great for developing presentations but less than perfect for delivering them. Being tied to a rigid "script" each time will not only become boring for the presenter but usually the audience as well, so I set out to create a presentation app that lets me deliver "live" presentations however I want. The unique interface lets you annotate and hi-lite your slides on the fly, moving the material far beyond static imagery, grabbing & focusing viewer attention where you want it. Clean, uncluttered interface, truly WYSIWYG. Elegant gesture-driven animated page transitions. Makes non-linear “excursions” from your flow easy and painless. Easy to return to the flow too! Dropbox integration for cloud-exchange of PDF’s (can also import from Mail & other apps). On-slide animations for emphasis and clarity. 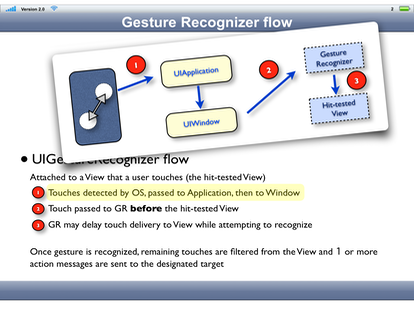 On-slide annotations with unlimited step-by-step undo/redo. Supports embedded PDF hyper-links, both in-presentation and to the internet. 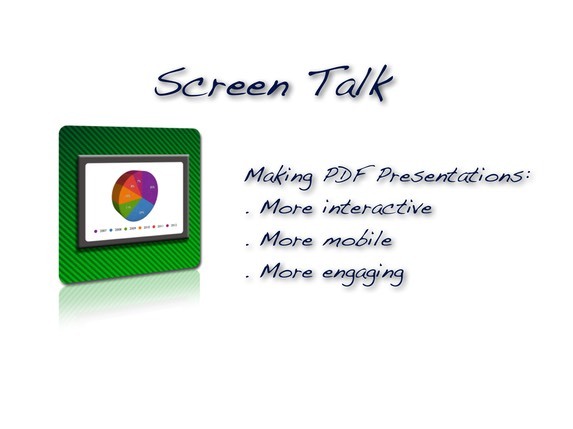 Load support files into Screen Talk and use to enhance your presentation. Build “filesets” from your suport files that can be associated with specific slides in your presentations. Apple TV or a Mac/Windows laptop + 3rd party app. required for AirPlay connectivity. 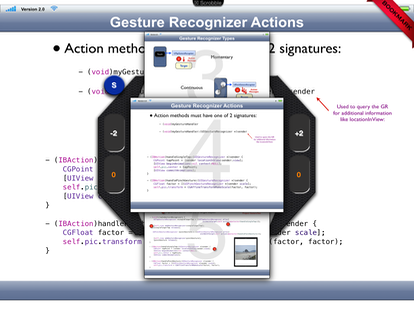 An intuitive multi-touch interface lets you annotate and even animate your PDF slides… entirely on the fly. Animated effects are fully customizable AND these customizations are remembered the next time the PDF is loaded. What about a question that requires you to jump out of the flow? The 3D slide browser lets you find the right slide(s) quickly and easily. And Screen Talk automatically bookmarks your position so, question answered, a double-tap smoothly returns you to the flow. 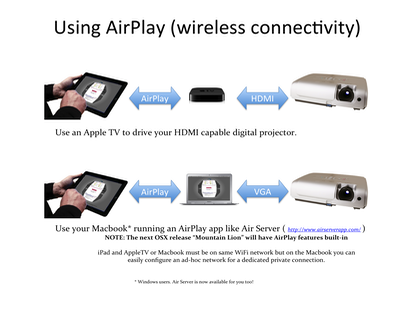 Screen Talk uses AirPlay Mirroring to connect with a projector or other display device. An Apple TV makes a great connection. By using the excellent third-party app “Reflector” from Squirrels, it is also possible to mirror to a laptop which drives the projector conventonally. 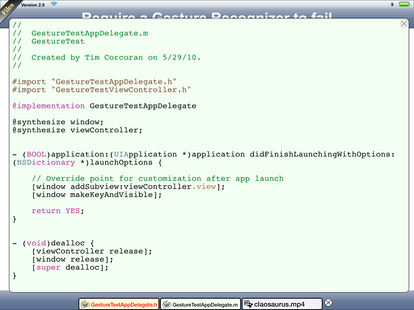 This is what I use, so my laptop is available for demos, compiles etc. PDF files are easily imported from mail and other apps. Dropbox integration means files can be transferred to/from the cloud with a simple drag-n-drop. Files transferred to Dropbox preserve all App settings with the PDF. Deleting files from the iPad OR Dropbox is also easy. Presentations don't exist in a vacuum. Support files are often vital, whether it's an Excel spreadsheet, a short Movie, some JPG pics or just some text files. Screen Talk lets me define "filesets" which are sets of files that I can load with a single tap at specific locations in a presentation. It’s easy to import these files and associate them with any particular slide in your presentation. 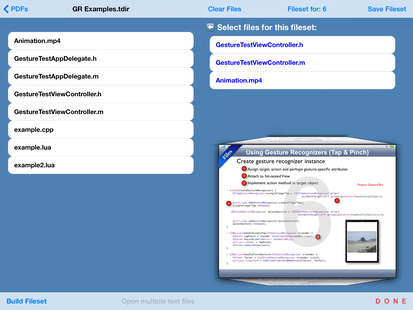 This screenshot shows that filesets may be edited, moved or copied. Now, when that slide opens you have the option of displaying a row of buttons along the bottom of the slide, one button per file. While almost any filetype may be displayed, I teach programming courses, so source-code examples are particularly important to me. That’s why Screen Talk has automatic full color syntax hiiting for 17 popular programming langauges.